Torsten Nordenfeldt's steam-powered submarine, 1885. Torsten Nordenfeldt's steam powered submarine being demonstrated off Landskrona, Sweden, to dignitaries including the Prince of Wales and the Danish royal family. Inset are portraits of Nordenfeldt, Captain Garrett, and a section across the vessel, showing Nordenfeldt explaining details of its workings and construction. 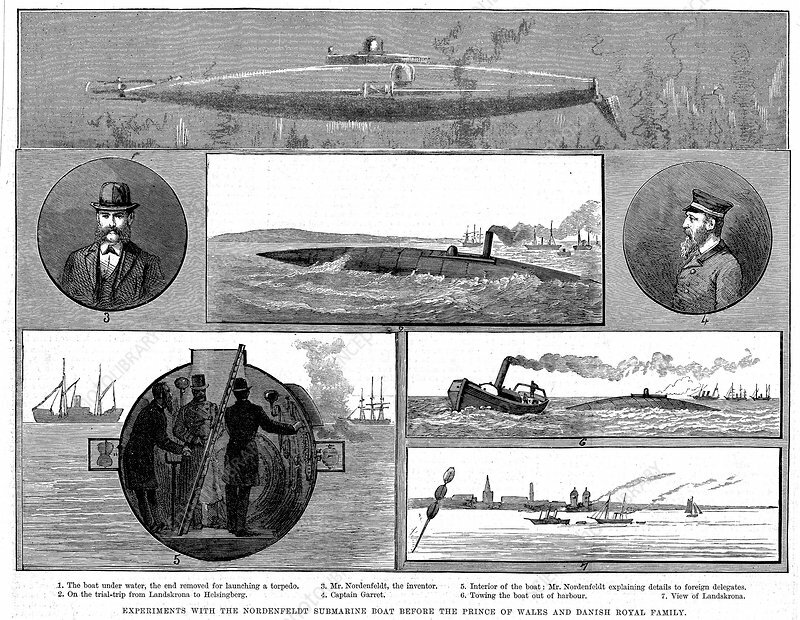 Nordenfeldt, a Swede, built a submarine capable of travelling submerged for 14 miles and of firing a torpedo. His design was an improvement on an earlier vessel designed by an English clergyman named George W Garrett. Nordenfeldt's submarine was eventually purchased by the government of Greece.